Tattoos are becoming more and more common things for people to get. Whereas once upon a time it used to be something which was only for rebels and rock stars, it’s now something that you see on just about every kind of person. However, there are still some things to consider before you go get inked. Since it’s a permanent alteration to your body it’s important to think about all of the following things before you get one done. If you want to get a quality tattoo which will be done in the style that you want and lasts for a long time you should make sure that it will fit into your budget. The last thing that you want is to have to take out a loan in order to be able to pay your mortgage after getting a tattoo that you really couldn’t afford in the big picture. Remember, that most tattoo artists charge at least $150 an hour, so if you are thinking of getting a design which will take hours to do, you may want to get a price quote before being handed a huge bill. Try to factor in design with price in order to make the best decision with your tattoo. Is it Appropriate With Your Line Of Work? 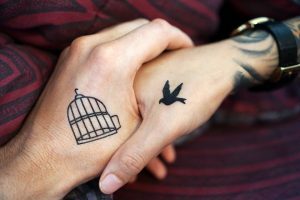 Although tattoos are becoming more and more accepted in mainstream culture, it’s important to consider that it may not be appropriate for everywhere. If you work in customer service or have a high profile corporate position you may be expected to fulfill a certain level of professionalism. Therefore, having visible tattoos may not be the best idea for your work. How High Is Your Pain Tolerance? Even the smallest of tattoos will require a bit of pain. This is because you are scarring your skin and will feel pain from the needle as the ink stains you. Try to be honest with yourself about whether you have a very low tolerance for pain. Depending on how much pain you can handle in a single sitting may be the determining factor about whether you think you want to go through with it or not. Bigger tattoos in more sensitive areas may require hours of extreme discomfort followed by sometimes weeks of healing. Some people get tattoos on a whim only to find that they don’t identify with the design later. This is because perhaps it wasn’t well done, or perhaps they just don’t like the tattoo anymore since it was from a different period of their life. Always make sure to ask yourself whether you are getting something imprinted on your body which you will appreciate permanently.